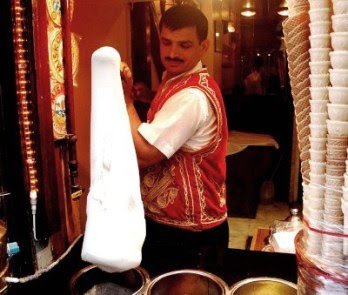 I have always wanted to try that icecream made with salep(? )I watched it being made on TV and the guy was hacking it with an axe to cut it, and is it true it takes longer to melt? Yes it takes along time to melt. How long? I cant tell you as it usually gets eaten before it has the chance. İn the above photo it is served with a splade and it is very firm, hard to cut into. Hi Reza, making icecream is fun and easy with alot of google page results so finding a recipe is easy. I found this link on youtube for very easy and basic icecream. Turkish icecream is very thick as they have other ingredients in it that I cannot get in Australia. It is a powder made from an orchid root. The Turks also use goats milk. Good luck with your icecream. As Simcha points out, real Maraş Dondurma requires powder from an (endangered) orchid but the link above contained some suggestions for alternatives. Best of luck!